I had a wire wheel powdercoated and the guy must have gone hog wild on the inside of the wheel. You cannot put the wheel on the hub because of too much paint. What is the best way to remove it? 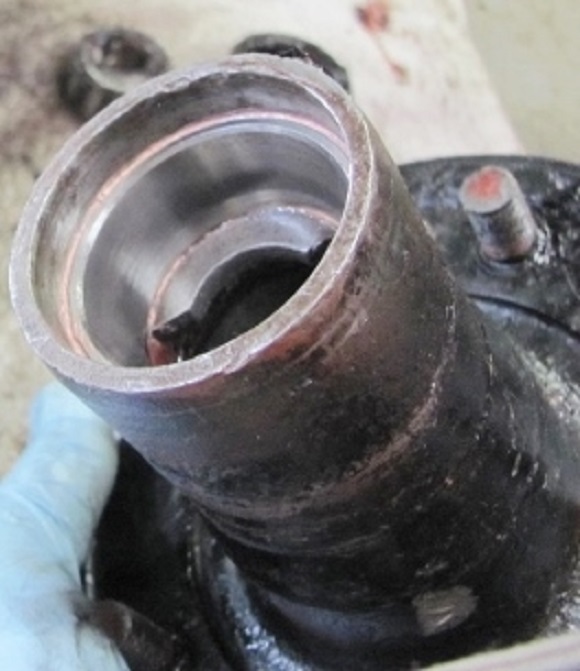 That happens sometimes I find the inside ID of the wheel hubs vary. I just had that happen on one I took a small wire wheel on an air tool took off some of the powder coat.You can't see it so it doesn't matter. It's not the fault of the power coater. I had wire wheels done for another car recently and had to ream out the mounting holes to get them over the studs. 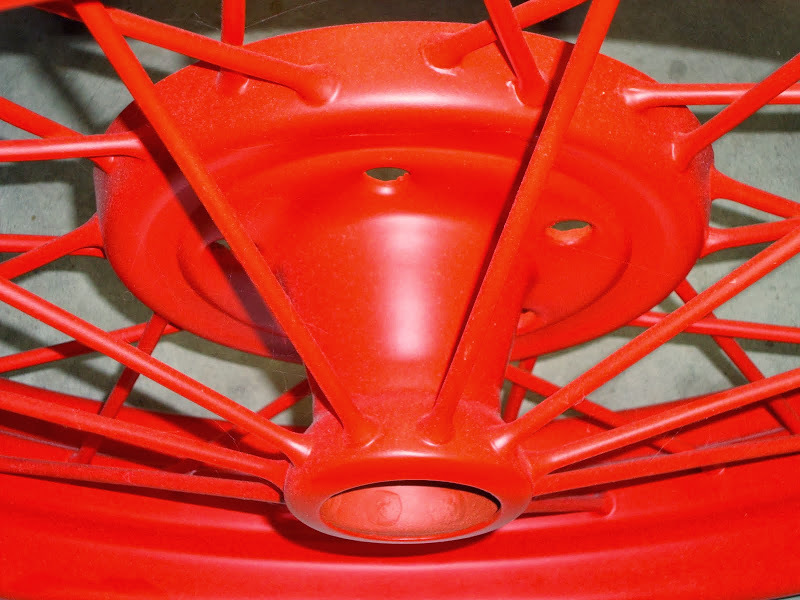 Powder coating goes on thick and often requires some tinkering if clearances are tight. That can happen easily. The Model T wire wheel has a 'Dixie Cup' shaped cone for the center, that is a design feature. The Ford wire wheel hub is a machined diameter for a way on the end of the hub that mates with that taper inside cone of the wheel to make it very stable when turning fast corners. When you powder coat a set of 5 be sure to check all 5 on both front hubs! If you have sticking, then a ball shape or cone shape stone on the hand grinder can remove that excess at the inside top rim of the cone on the wire wheel. Have done it before. You can see I sanded it some, but that does not remove the paint very well. The powder coater said he did wire wheels for Model A guys all the time. He originally had a wire holding up the wheel so the center had no paint where the wire was. That is probably a big source of rust, where you cannot see it. I could not believe he did it that way. The part that he did correctly looks really nice. I ended up just using primer and rustoleum. I forget why I did not let him do the wheel over again. I was thinking of using a sanding wheel, but am concerned about what that might do to the inside of the wheel. Maybe a wire wheel like Bill said would be best. Good shot of your wire center. 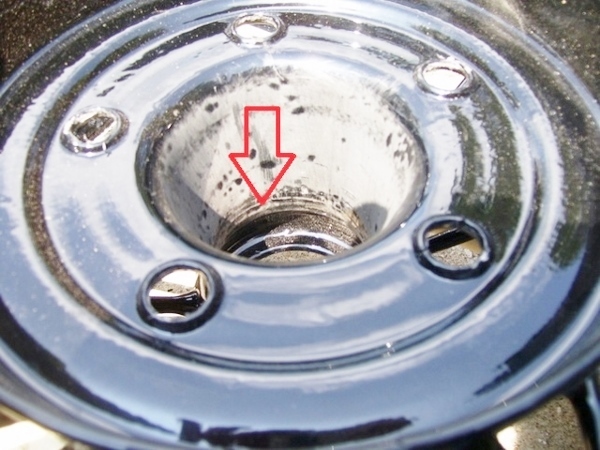 I marked with red arrow where I ran a grinder over this 'rim' area, that is where my powder coated wheel was too tight, removing just about 3/4" wide strip or so thinning of the powder coat around the top of the cone did the job. Another reason to paint wheels with enamel. You control the coating, and it is difficult to get it too thick! It is also easier to touch up scratches and there is no need for washers to protect the coating from damage around the wheel nuts as they are tightened. It is not as easy as delivering the wheels to someone else to do. This won't help Dave, but it may helps someone else down the track. put some paint stripper on the areas you wish to remove the powder coat from. I will have to correct you on the point of "Powder Coat is Paint". Powder coat is nothing more than electro static charged low melting temp plastic. Paint is of resins, binders, activators, and reducers. Most apply powder coat incorrectly and that is why it peals off just like plastic dipped items. Sorry, no disrespect intended, but facts are facts. Powder coat in a professional view is as cheap as vinyl siding on a house. One nick and the corrosion begins. 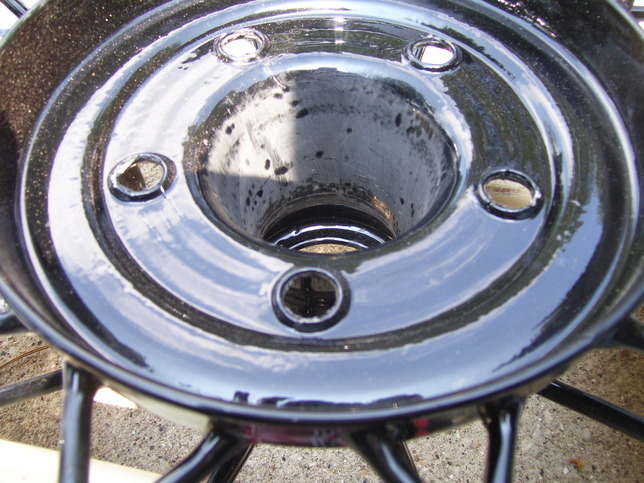 We make it a standard practice to ream the mounting holes on any wheel we have coated. Keeps the coating from chipping and allows the nut to seat on metal. Peter has previously explained his take on powder coating, and it made sense to me at the time. However, my experience is as Henry relates. One nick and moisture gets under the skin and away goes the rust underneath. Mark's suggestion to remove the coating back to bare metal where the lug nuts engage makes mechanical sense but invites the rust problem. A local bicycle manufacturer used the electro static application method to apply liquid paint to tubular frames and these were then baked to dry/harden the coating. They called it baked enameling. Perhaps there is some confusion between the two processes. I stick to lacquer for body work to get a more authentic finish than the super high gloss of two pack urethanes. My finish of choice for wire wheels is oil based enamel. It gives a gloss off the gun not achievable with lacquer. It is easy to touch up if scratched. It does not suffer from moisture tracking under the coating. But it does require care in application to avoid runs and missed spots if not applied systematically. Don't want to get into a what is facts or not but having been involved in the powder coatings for 40 plus years I have some knowledge of what it actually is. A quick search on Wikipedia explains exactly what it is. Still my answer that it can be removed with paint stripper is a solution to Dave Hjortnaes's problem of getting rid of the powder coating from his wheels. Have to agree with you about the fact that often it has problems, due mainly to it being applied incorrectly. Because it requires virtually no skill to apply usually basic labourers are employed to do the work, so you usually get someone who doesn't know exactly what to do or if shown doesn't care as long as he gets paid at the end of the day. I would only ever use powder coating on wire wheels. Done correctly it is far superior to a solvent based paint application, especially as the electrostatic application will put an even coating of every surface before applying extra build up. A good operator will know how much that is. Want to stop the powder from loosing adhesion? the part should be heated first to the temperature the powder requires to melt, when the powder is then applied it will adhere properly, the job needs to then be again heated in the oven. Takes longer, often skipped if they are doing a cheap job. For those worried about areas being blocked up with the powder, do as Jim Patrick suggested and mask it off or in the case of small threaded holes stuff a piece of cotton rag into the hole so the powder can not get to the threads. Please excuse me as YOU are one of the first to do powder coating. And I remember when it was coming out and a friend of mine went to all the schools. As you said, "The Prep is everything" There is the problem, getting it to a super low humidity environment, then preheat, then apply and bake. We have a problem as most just hurry up for a buck, Yep, it's shinny, done. With all painting it's the prep that takes the time which means labour/money. Painting a whole car takes only a few minutes but it can take weeks to get to that point. One more point for Dave and his thick coated wheel. Where the nuts engage the wheel holes there will probably be an excess of powder also. What needs to be done is remove as much as possible of the coating between the nut contact points and those of the hub holes. If there is a thick coating tightening up the nuts will tend to squeeze out the powder coat and you will probably get chips flaking off around the edge of the nuts or if that does not happen the wheel will work on the area and the powder will break away and the nuts ( and the wheel hub ) will become loose, not something one needs to happen especially if it's not noticed and the nuts fall off. A suitable shaped abrasive stone on a shaft to clean off the coating where the nut clamps onto the hub so you get a metal to metal contact is the way to go.